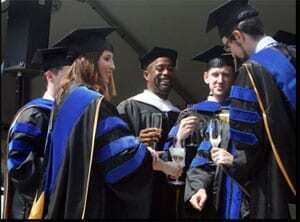 Darius Rucker was the keynote speaker at the Medical University of South Carolina commencement ceremony on May 20. In speaking to the graduates from six colleges within MUSC Rucker shared, “You guys said to the world, ‘I’m going to take my brains, my talents, and my smarts and I’m going to help make the world a better place,’ and I want to thank you for that. Today is a day I will never forget.” Rucker was surprised with an honorary diploma that he promised to display in his Charleston, S.C. home. “That way everyone should know to call me Dr. Rucker,” he said. 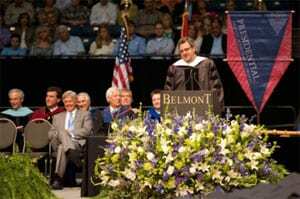 Gill accepts his Belmont University degree.